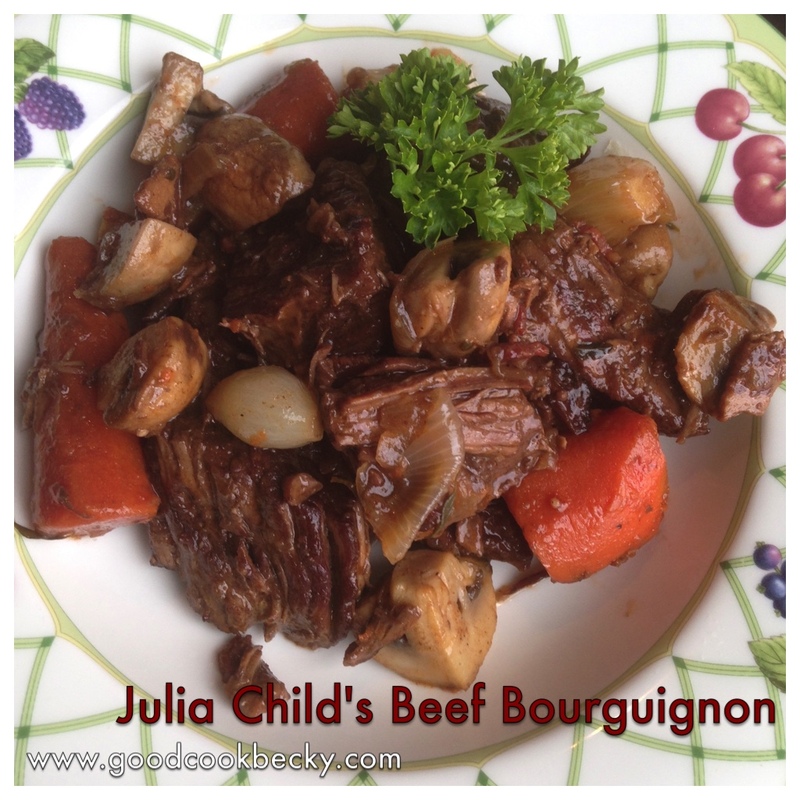 When I first watched the Movie “Julie and Julia”, I knew I had to make Julia Child’s recipe for Beef Bourguignon. I did make it and several times since (and blogged it in 2010), but I wanted to update the recipe and streamline the steps to make it even easier for myself (and others) to follow. Today, I made this recipe for my husband’s birthday. His birthday is not until Tuesday, however this recipe is not one to put together on a busy day – it demands 2 1/2 to 3 hours of cooking and about an hour in prep time. There are a lot of steps to this dish, but it is well worth the effort. Notes: There are two sub recipes that go into this recipe that can be made ahead. They are listed first. Baby onions are NOT the pearl onions (the size of marbles), I made this mistake they are about 1 inch in diameter. I peeled double the amount and they are quite tedious when you use the pearl onions – save yourself! If you have a large enameled cast iron pot (6 1/2 quart Le Creuset works great for me) it would be ideal, but you can use a heavy bottomed oven safe pot with a tight fitting lid instead. It is important to dry the meat before you sear it, and important to not over-crowd the pot while browning the meat (and mushrooms). I usually cook about 7 to 10 pieces at a time. Place skillet (same one you used for onions) over high heat and heat butter and oil. Once the foam from the butter subsides, saute the mushrooms in small batches about 4 to 5 minutes per batch. Remove the cooked mushrooms to a bowl and set aside until needed. Repeat with mushrooms until all are browned. In a large heavy bottomed pot, over medium-high heat, saute the bacon in 1 tablespoon of canola oil, until it is browned and crispy. Remove the bacon with a slotted spoon. Turn the heat up to high and brown your pieces of meat, in batches, in the rendered bacon fat, turning them over to brown other sides until you have a nice crust. Remember not to crowd the meat, or it will not brown properly. Repeat until all your meat is nicely browned. Remove the meat to a medium bowl. Brown the onion slices and chunks of carrot in the same bacon drippings. Pour off any excess bacon fat (though I rarely have any). Add the bacon and beef to the carrots and sliced onions you just browned. In a small bowl, combine the flour, salt and pepper and combine. Sprinkle the flour mixture over the beef and toss to coat the mixture. Place the pot (uncovered) in the preheated oven and cook for 4 minutes. Remove from oven, toss again and return to oven for an additional 4 minutes. Remove the pot from the oven and place back on the burner, over medium heat. Reduce the oven temperature to 325 F.
Add the red wine into your beef and stir, scraping the bottom of the pot to loosen any browned bits. Add 4 cups of beef broth (or as much as you need to cover the beef completely). Add tomato paste, garlic, thyme, and bay leaf and stir to combine. Bring the stew to a near boil. Turn off your burner. Place a lid on your pot and transfer to the oven. Allow to braise for 2 1/2 to 3 hours, stirring once half way through. Remove the beef and carrots to a large bowl. Pour your broth through a colander into a 4 cup capacity gravy separator. Allow the gravy to separate and skim off the excess fat. Adjust the seasoning of the broth (add salt if necessary) – I rarely need to do so. Clean your pot and return the beef and carrots back to the pot. Add your baby onions and mushrooms and stir to combine (if you made them ahead and refrigerated them, reheat them in the microwave before adding). Serve with cooked baby potatoes, egg noodle pasta, or steamed rice and green veggies. Pour the gravy over the Beef Bourguignon and enjoy! 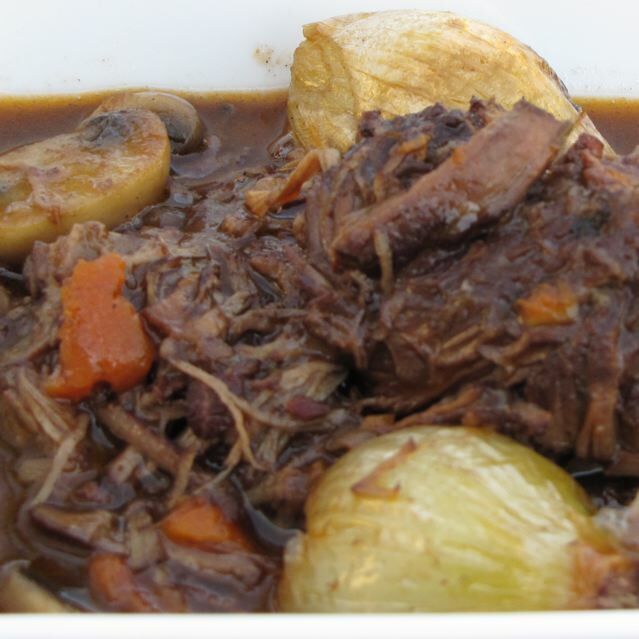 Categories: Ethnic, Ethnic - French, Favorite, Julia Child, Main Dish, Main Dish - Beef, Top Picks | Tags: Beef Bourguignon, Julia Child, Julia Child's Beef Bourguignon | Permalink. Part 4 of 4 of my daughter’s French Meal for her French Class is of course dessert. In hindsight I should have made other crepes that do not call for alcohol. We have children after all and my husband and I found the taste of it overpowering. But I cannot be certain that it burned off properly. As it turn out my daughter (14) is actually pretty good at making crepes. Okay, we started off rough. The first 15 or so crepes ended up in a discarded heap, but as time went on, they were actual crepes, that we could use. I doubled the batter knowing that we would likely have difficulty making the crepes (but the recipe is the original amounts). The batter must be refrigerated at least 2 hours before making the crepes, so plan ahead. Place the items in a blender (or do as I did in a bowl and use an immersion blender to combine) and blend. Use a rubber spatula to push down any flour that is on the sides to form a smooth batter without lumps. Refrigerate the batter at least 2 hours or longer before making the crepes. Combine the sugar, orange zest, softened butter and add the orange juice and orange liqueur. Stir to combine. Place them in a chafing dish and allow the butter to melt into an orange sauce (I didn’t have a chafing dish and placed a foil lasagna pan over a low flame on my gas burner. 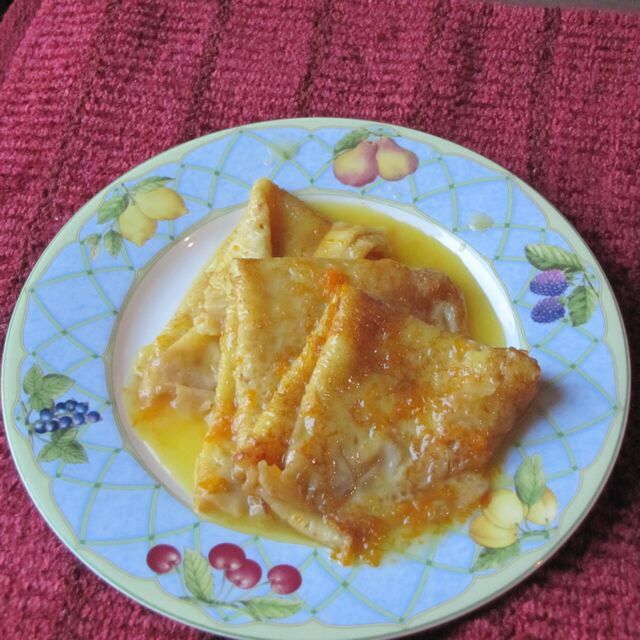 Dip the prepared crepes into the orange sauce to coat on both sides and then fold them first in half and then in quarters and place to the side of your chafing dish (foil lasagna pan). For presentation: Sprinkle the arranged crepes with sugar. Pour the alcohol over the crepes and light it on fire (make sure you don’t have anything above it- like a face, hair, microwave… I did this part on my table making sure everyone was standing well away). While the flame is burning, ladle the sauce over the crepes with a long handled spoon. For some reason it did not burn as much as we had anticipated and the crepes had a sharp alcoholic taste to them. If I do make them again, I will stop short of the alcohol and just serve them like that, maybe broil the sugar to get a caramelized look to it. NOTES: It was part of my daughter’s French project, we were glad to get it done. As far as making it again, probably not, but it was a good experience for us. My daughter now realized she can make herself some pancakes for breakfast – since she has now made crepes! Categories: Dessert - Fruit, Desserts, Ethnic, Ethnic - French, Julia Child | Permalink. We really liked the scalloped potatoes and buttered beans. I have had more flavorful chicken, but it was not bad. The sauce was good. The recipe is pretty involved for the chicken, but it was certainly still in the good category. Julia Child really explains her recipes well. The steps are well spelled out. For the Chicken: Heat the butter in a large skillet over moderate heat until it is foaming. Add the minced shallot and cook for a minute or two, without browning the shallot. Add the mushrooms and cook stirring from time to time, but not browning the mushrooms. Season with salt. Sprinkle the chicken breast halves with lemon juice and season with salt and pepper. Quickly roll the chicken in the butter and mushrooms. Butter a piece of waxed paper on one side. Lay the paper buttered side down onto the chicken breasts. Cover the skillet with a lid and put in the preheated oven. After 6 minutes press your finger on the chicken breasts to test if they are done. (If the chicken is soft to touch it still needs time to cook, if it springs back they are ready). Remove the chicken to a warm platter and prepare the sauce. For the sauce: Pour the beef broth and white wine into the skillet with the mushrooms and butter. Bring it to boil and reduce the liquid until it is syrupy. Add the whipping cream and reduce liquid to thicken slightly. Turn off the heat and taste adjust the seasoning with additional salt and pepper and lemon juice if desired. Pour the sauce over the chicken and sprinkle with parsley. Serve while hot. Cook the green beans in a covered saucepan with 1 inch of water, and 1 tsp of salt. Bring to a boil, reduce heat and cover. Steam the green beans for about 10 minutes, or until crisp tender. Pour off the water. Heat the beans to evaporate the excess water. Season with salt and pepper and toss. Pour into a prepared serving dish. 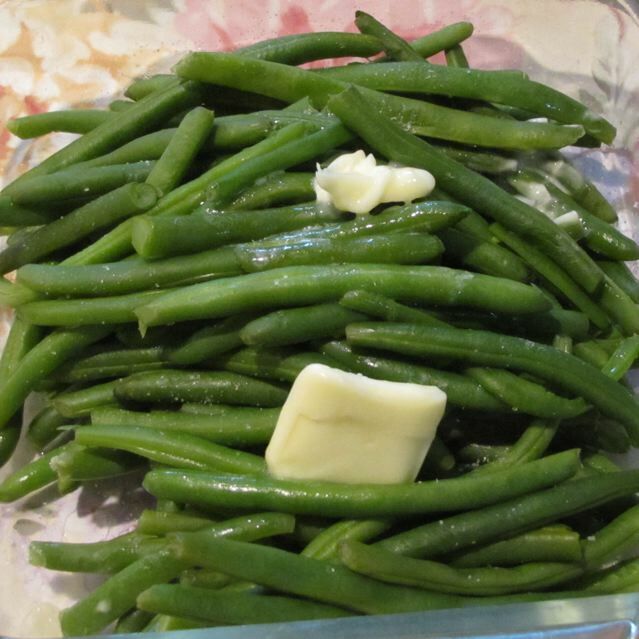 Dot the green beans with pieces of butter. Serve while hot. Peel and slice the potatoes 1/8 inch thick. Keep them in a bowl of water until you need them to prevent browning. Drain and dry on paper towels when ready to use. Rub the bottom and sides of the baking dish with the slices of garlic to give it a little flavor. Coat the baking dish with butter. Place 1/2 of the sliced potatoes in a neat layer along the bottom of the baking dish. Season with salt and pepper, sprinkle with 1/2 of the cheese and dot with half the butter. Repeat with a layer of potatoes, season, sprinkle with cheese and butter. Pour the boiling milk over the potatoes and bake at 425F for 20-30 minutes. If they are just underdone, cover with foil and allow them to sit for about 10 minutes while you finish other parts of your meal – or bake them another 5 minutes. 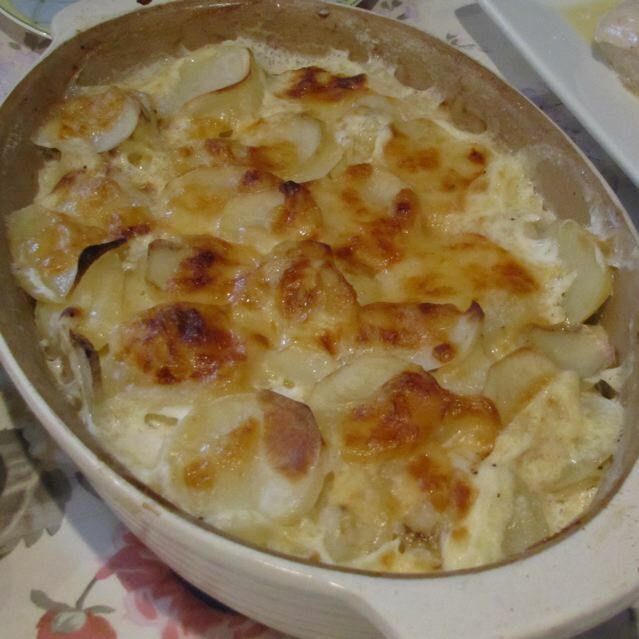 Categories: Ethnic, Ethnic - French, Julia Child, Main Dish, Main Dish - Chicken, Side - Vegetable, Side Dish - Potatoes, Side Dishes | Permalink. 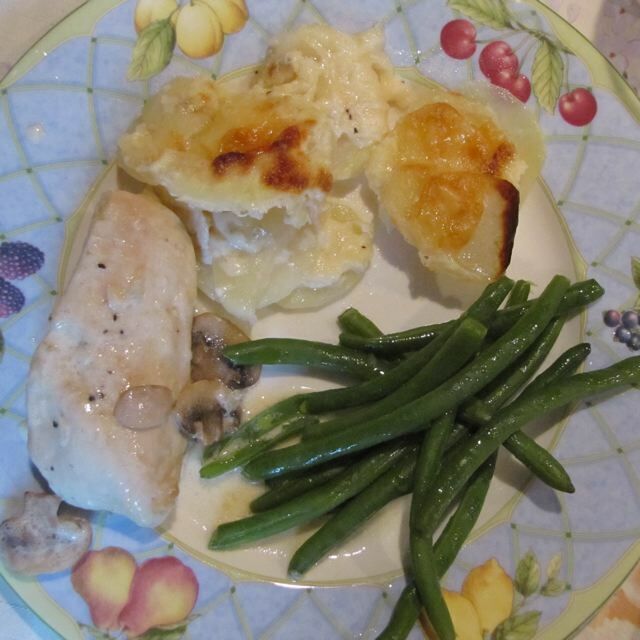 This is Part 2 of a series of 4 for a 4 course French meal that my daughter had to help prepare. 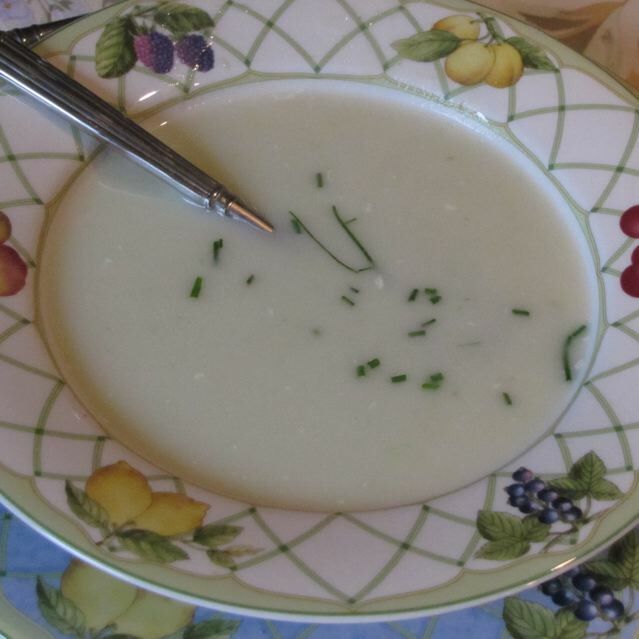 Our soup course: Leek and Potato Soup. A recipe from Julia Child (adapted from Mastering the Art of French Cooking page 37-38). In a large stock pot, combine the leeks and potatoes. Cover with the water and season with salt. Bring to a boil, reduce heat and simmer with a lid mostly on, but vented. Cook for 40-50 minutes until the vegetables are tender. Mash the vegetables, or use an immersion blender to blend the vegetables and broth. Just before serving stir in the whipping cream to make it a cream soup. Garnish with parsley or chives. Categories: Ethnic, Ethnic - French, Julia Child, Main Dish, Main Dish - Soups | Tags: Julia Child, Leek and Potato Soup, Potage parmentier | Permalink. 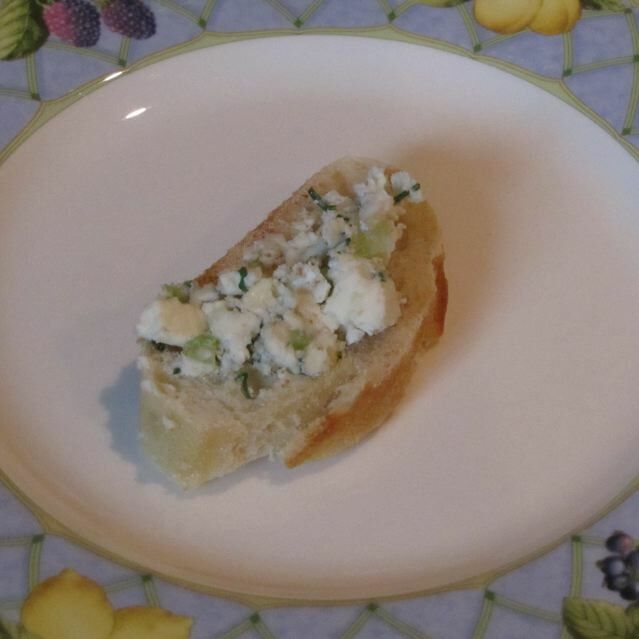 For the appetizer we made a blue cheese ball with slices of French Baguette. 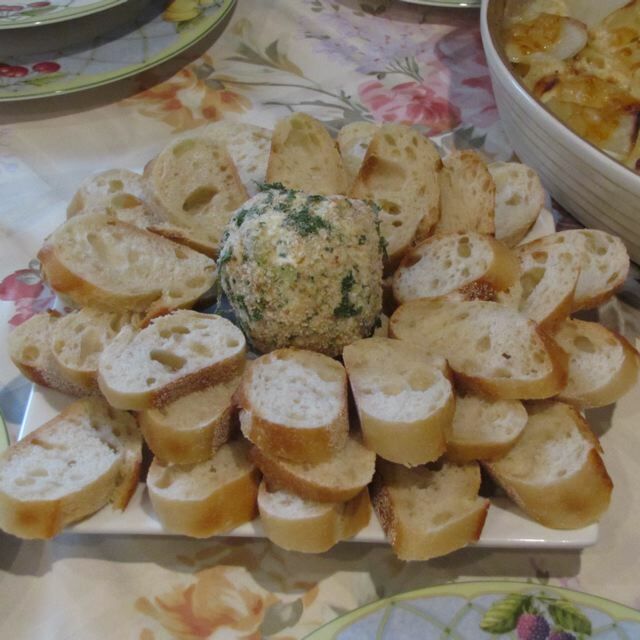 My daughter arranged the bread and cheese ball very nicely I thought! Well the name of it.. I won’t begin to try to pronounce.. that will be my daughter’s job. But let me say this: I will be making this appetizer for the next party. It is easy to make and is very good (if you like blue cheese you will LOVE it!) My son loved it too. He is 8, but my most adventurous eater. I halved the recipe, because it was just for our family. Combine the blue cheese, softened butter. Add chives, celery, cayenne pepper, pepper and Worcestershire sauce. Stir until well combined. In a separate bowl, combine the breadcrumbs and minced parsley. Roll the cheese ball in the bread crumb mixture until it is well coated. Refrigerate until serving. Serve with slices of French baguette or crackers. Categories: Appetizers, Dips, Ethnic, Ethnic - French, Julia Child, Snack Food | Tags: Amuse-Gueule au Roquefort, Blue Cheese ball, Julia Child | Permalink. Making Julia Child’s recipe of Boeuf Bourguignon has been on my “bucket list” of recipes I wanted to make for a while now. This past weekend was to hectic to make something this involved, so it fell on a Monday – a very special Monday meal! I made it – and we ate it! YUMM! A word of warning: It is time consuming, but Julia set the recipe out in simple steps that it is completely doable, even for the cook who has only a little experience. The best choice of meat to use in this is: Rump Pot Roast, but Chuck Pot Roast (which I used) or Sirloin Tip, Top Round, Bottom Round are also acceptable cuts. Saute the bacon in 1 Tbsp cooking oil in a large enameled cast iron pot (I love my 6 1/2 quart Le Creuset it is perfect for this dish) for 2-3 minutes to brown lightly. Use a slotted spoon to remove the bacon to a large bowl. Dry the beef (3 lbs stewing beef cut into 2 inch cubes) with paper towels. This improves the browning of the beef. Bring the bacon fat up to almost a smoking point and brown the meat in batches so it can get a nice crusty sear on them, turning them from time to time to brown another side. Remove the meat cubes and add to the bacon and repeat with remaining beef. Once the meat is browned, brown the vegetables (1 sliced carrot – I love carrots I used 3 medium ones; 1 sliced onion). Pour off the bacon grease (mine did not have any grease after browning the vegetables. Return the browned beef and bacon to the pot. Season with 1 teaspoon salt and 1/4 teaspoon pepper and toss to coat. Then sprinkle with 2 Tablespoons of flour and toss to coat again. Place the uncovered pot in the middle of your preheated oven and cook for 4 minutes. Remove, stir again and cook in oven another 4 minutes. Remove from oven and reduce oven to 325F. Stir in 3 cups full bodied red wine (Bordeaux, Burgundy or Chianti- I used Chianti). Add enough beef stock or beef bouillon to cover the meat (2-3 cups depending on your pot). Stir in 1 Tablespoon tomato paste, 2 mashed garlic cloves, 1/2 teaspoon fresh thyme, a crumbled bay leaf and blanched bacon rind (if you had one). Bring to a simmer (just below a boil) on the stove top and then cover with the lid and place in the oven. Allow to braise 2 1/2-3 hours. I had to take my kids to piano lessons at this point and it was to finish during lessons, so since hubby was home I set the timer and directed him to just turn off the oven at the specified time and let it sit for the time that I was gone. By the time I returned home it was closer to 4 hours but since it didn’t have the heat going it was just fine and not dried out. When the butter and oil are bubbling in the skillet, add the onions and cook over medium heat for about 10 minutes, turning the onions carefully so as not to damage their skins and allow them to brown. Remove the onions to a small baking dish and add 1/2 cup of beef stock to the dish and a few springs of parsley, and thyme. Roast them in the 350F oven for 40-50 minutes until tender but retain their shape, turning them once or twice. Remove the herbs. Place skillet on high heat with the butter and oil. As soon as you see the butter foam has begun to subside and the mushrooms in smaller batches (if they are crowded they will not brown). Toss and shake the pan for 4-5 minutes until the mushrooms begin to brown and remove them immediately to a separate dish. Repeat with remaining mushrooms. When the beef is tender remove to a large bowl. Pour the juices into a sieve over a bowl to capture the juices. Wash out your dutch oven and return the meat and bacon to it. Distribute your prepared baby onions and cooked mushrooms over the meat. Skim off the fat from the reserved juices. Simmer the sauce in a pan and skim remaining fat as it rises. You should have 2 1/2 cups of sauce thick enough to coat a spoon. Taste carefully for seasoning and add salt if necessary. I didn’t have to it was great! Serve with boiled potatoes, cooked pasta or steamed rice. Categories: Ethnic - French, Julia Child, Main Dish - Beef | Tags: Beef Bourguignon, Julia Child's Beef Bouguignon | Permalink.